The charter’s pledges range from the protection of children from harm and having opportunities to play a full role in shaping the city around them to being able to have positive choices about their lives and development. Aligning the pledges with those of the United Nations Convention on the Rights of the Child, the charter applies to every child without discrimination, whatever their ethnicity, gender, religion, language, abilities or any other status, whatever they think or say, whatever their family background. The charter will now sit as part of the One City Plan, the emerging shared vision for Bristol being contributed to by key organisations across the city. 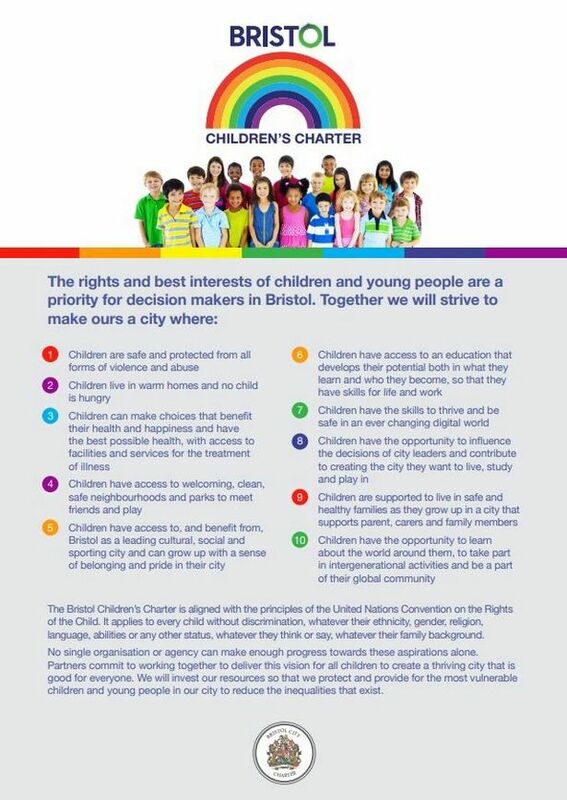 Any organisation wishing to sign the charter and become a part of the pledge to develop a city that protects and provides for children and young people should contact Councillor Helen Godwin, Cabinet Member for Women, Children and Families on: Cllr.Helen.Godwin@bristol.gov.uk. The Bristol Child Friendly City Group and partners the Architecture Centre and playing Out signed the charter at its launch yesterday.